Der Artikel Herbie Mann (1930-2003): Four Classic Albums wurde in den Warenkorb gelegt. 4 klassische Alben von Herbie Mann inklusive Original LP Liner Notes auf einer digital remasterten 2CD! 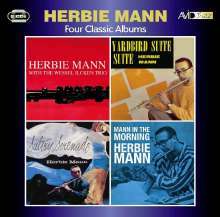 AVID Jazz here presents four classic Herbie Mann albums including original LP liner notes on a finely re-mastered and low priced double CD. “Wessel Ilcken Trio”………………This hard to find and previously unavailable in the UK on CD album was one of Herbie’s very early recordings made during a trip to Holland and featuring local musicians. The album finds Herbie joined by the late Wessel Ilcken on drums and two brothers Pim and Roud Jacobs on piano and bass respectively. Herbie himself switches between flute, tenor sax and clarinet. “Sultry Serenade”………..the focus on this album is not just the playing but also the arranging skills of Herbie Mann. As the original liner notes point out “one of the notable features is the overall unity and internal musical consistency and purpose “. Here this is achieved with some fine musicians, Urbie Green on trombone, Jack Nimitz on baritone sax, Oscar Pettiford on bass, Joe Puma on guitar and Charlie Smith on drums. “Yardbird Suite”…………..Herbie is here joined by Phil Woods on alto sax, Eddie Costa on vibes, Joe Puma on guitar, Wendell Marshall on bass and Bobby Donaldson on drums for an essentially driving, rhythmically dynamic and ultimately very fine jazz album! “Mann in the Morning”…………the second hard to find and previously unavailable in the UK on CD selection and our final album “Mann in the Morning“ finds Herbie this time in Sweden where he restricts himself to just the flute and tenor sax duties playing alongside three basic groups of musicians. Recorded in 1957 this fine album is testament to the improvements in his playing that Herbie had made both on flute and sax! All four albums have been digitally re-mastered.